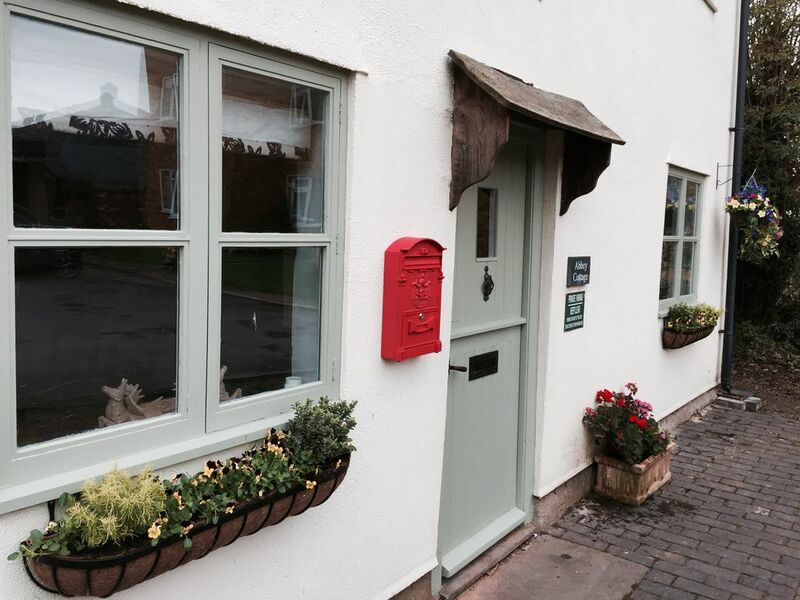 Luxury period cottage close to Tewkesbury Abbey/Great for exploring Cotswolds! Lovely well equipped luxury beamed 17th Century Cottage only steps from historical Tewkesbury Abbey with exposed floorboards and original flagstones. Fabulous fireplaces and hotel quality towels and bedlinen and luxury comfortable rooms. Each room is personally and stylishly decorated to enhance your experience but with all the up to date mod cons. Safety precautions in place. Private enclosed garden. Free off road parking for 1 car. Free wifi - Pets OK! Great location for exploring Cotswolds and 15 mins Cheltenham Racecourse. Two double bedrooms and one single. Note bedrooms accessed by stairs which are steeper than standard as a period property but has an excellent handrail fitted. We moved to Tewkesbury in 2013 and absolutely love it, the lovely antique shops are great for a browse around and there are great coffee shops and restaurants and takeaways all on your doorstep. The Abbey is something else and the town has that real feel of a Medieval Market Town right at the edge of the Cotswolds. It is so lovely too to have the Avon and Severn rivers on the edge of town. Great for cyclists, golf, walkers, fishing, families and friends! Great location near Tewkesbury Abbey, shops, pubs and Restaurants. Great for exploring Cotswolds. Only 15 mins from Cheltenham Racecourse.Luxury touches! Spacious lounge with seats for up to 8, Dining Table for 6. Lovely period features. Quiet location in Town. In Alley across the road from Tewkesbury Abbey. Best restaurants and cafes only minutes from Cottage. Luxury Touches!!!! Well furnished. Kitchen and bathroom appliances were of a high standard as were the bathroom towels and face flannel. Would have appreciated floor lamps for reading x 2/3, had to make do and mend with other lighting. Also a larger footstool would be welcome. Suggest that the fire controls should be done by a remote handset, as gas fire casing is very hot when wanting to turn it off or down. Gazco, the manufacturer do make/supply these. Abbey Cottage is a perfectly appointed, comfortable home in a quiet area at the center of town. Kathy and Colin have created a cozy and welcoming atmosphere and I would count myself lucky to be able to stay here again. We really loved this cottage. It was in a perfect position for the town centre and also very quiet. Spotlessly clean and lovely touches, like milk in the fridge and biscuits, tea bags, coffee, and sugar. Very comfortable beds. Being able to park the car right in front of the cottage was a bonus. We will definitely go back, there is so much to do and see in Tewkesbury and nearby. Thrilled you loved our cottage, you are welcome back anytime! Abbey Cottage is in Smiths Court which is off St Marys Lane by car and off Church street on foot. Parking for 1 car in front of cottage and a few meters away additional parking available on the Public Car Park at up to £4 per day.